"Prepublication Version: Express Yourself: Striking a Balance Between Silence and Active, Purposive Opposition Under Title VII's Antiretaliation Provision" by Matthew W. Green, Jr. This article examines where to draw the line for opposition to be actionable under the antiretaliation provision of Title VII of the Civil Rights Act of 1964. The article examines the issue by using Crawford v. Metropolitan Government of Nashville & Davidson County, 129 S.Ct. 846 (2009), as the backdrop to engage in a broader discussion on the topic. 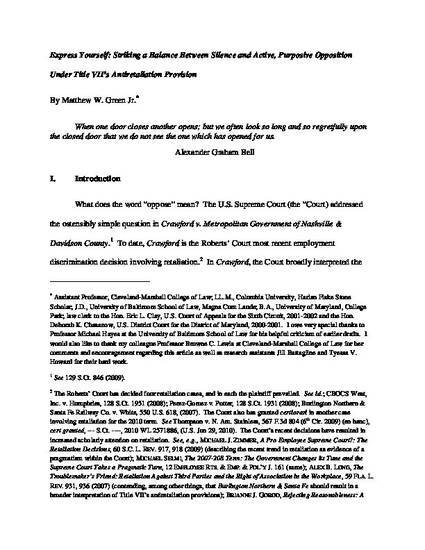 Scholars have not yet explored the extent to which Crawford allows courts, litigants and others to think in new ways about the opposition clause of Title VII and similarly worded antidiscrimination statutes. This article takes on that task. The article calls for striking a balance between extremes. Crawford suggests in dicta that under its plain meaning, the term oppose may embrace opposition by “opinion,” and lower courts and commentators have pondered whether Crawford opens the door to silent opposition. The article rejects such a reading of Title VII after examining the language, context, structure and purposes of the statute. The article, however, also examines and rejects the active, purposive standard of opposition that Justice Alito advocated in his Crawford concurrence and that lower courts pre- and post-Crawford have adopted. The article demonstrates that the active, purposive standard is inconsistent with the plain language of the statute, ignores authority that has long sanctioned unintentional opposition, exacerbates existing gaps in protection that feminist scholars and others have recognized exist for victims of unlawful workplace harassment, and rests on irrelevant policy considerations. The article cogently argues that the statutory term “has opposed” contemplates an expression from which an employer may infer or interpret opposition and proscribes employers from discriminating on the basis of that expression. Such a definition embraces a swath of opposition from words, action and in proper circumstances even inaction. Crawford has opened doors to new ways of thinking about opposition under Title VII and similarly worded statutes, and this article begins that important discussion.